We depart Cairns early in the morning, full of anticipation for what is the first day of many we will spend trekking slowly towards the Cape. Winding along the Captain Cook Highway with the waves crashing just below, our convoy discusses over the radio which path we should take north once we hit the Daintree. Our goal for today is to reach Archer Point, just south of Cooktown. I imagine this conversation would happen on many trips like ours. Knowing you have so far to go before the Old Telegraph Track or even the Cape, hesitant to potentially ruin what is a big bucket-list trip for many. But in the end, as I’m sure most do, we picked the CREB. Most off-roading folk we’ve met all share the same balance between intense “track FOMO” and a keen dislike for being “beaten” by terrain. Figuring we could turn around if the track or weather became too rough (in hindsight this could have been quite tricky) we set off to the small town of Upper Daintree, making our way through the winding green hills that make this part of the world so beautiful. Arriving at the wide expanse of the Daintree river, we paused for a moment. This was our first water crossing of the trip, and it was quite a wide one. It also had to be a leap of faith – we were officially in croc country, the Daintree especially being renowned for them. It didn’t look deep, nor fast, but not being able to get out and check the crossing out properly was somewhat unnerving. Bravely, Eric opted to drive the old GQ across first, and did so with ease. 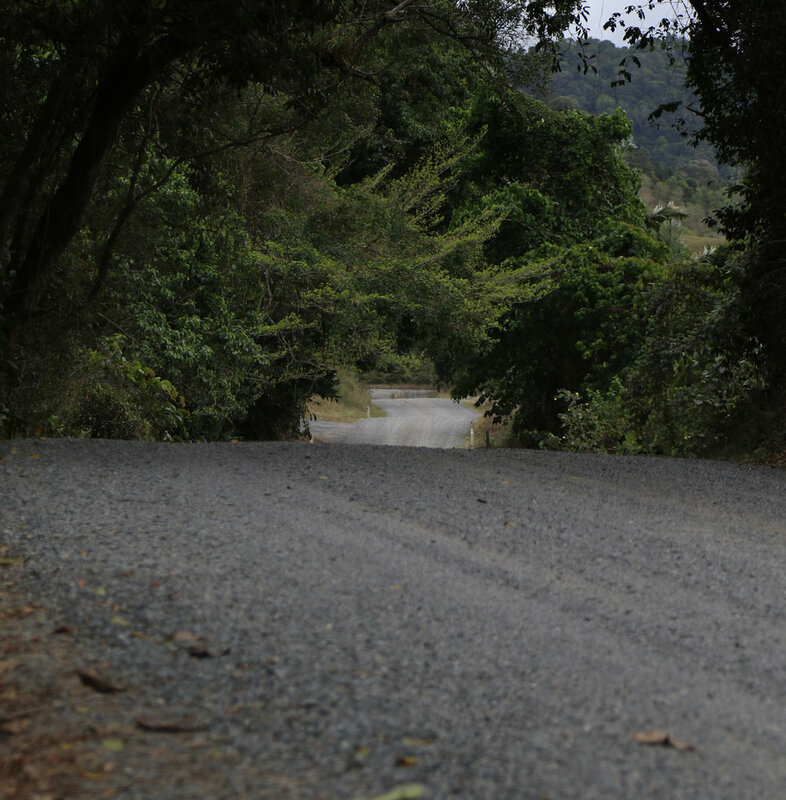 While the ascents and descents didn’t stop– the rainforest eventually got thicker and the threat of rolling the car subsided, and my camera came out once more. 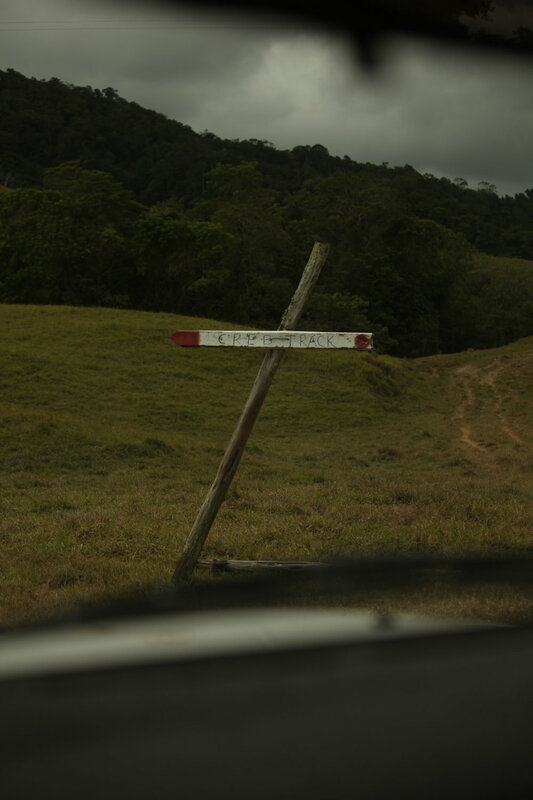 About an hour or so in we reached a fork in the road, with two well-worn tracks and no clear direction as to which to take – either on the track or our off-road maps. Figuring that the two would probably meet again further down we took the left, climbing further up the hillside rather than descending to the right. Reaching the top we were met with an incredibly steep stepped descent, flanked by ferns on both sides. with no choice but to go down, we slowly crawled down the hillside, allowing the clay to guide our wheels as it wanted, gently steering away from the banks when needed. Reaching the bottom, it transpired that the section we were on was closed (although there were no signs in the other direction) and that it was known as Bob’s Hill. It was about halfway through the journey that it became really breathtaking. The tiny, single-lane track reached a level point about halfway up the height of the ridges, and begun to wind in and around the forms of the mountainside, with thick rainforest above and below, moss-covered rocks and tiny waterfalls trickling down the tight bends of the track. Spending the better part of the next half hour with my mouth open in awe (I’m sure Matt gets tired of me exclaiming how magical things are), it was a place I struggled to capture accurately, but I doubt will ever leave me. Having had the pleasure of driving quite a few rainforests in our beautiful subtropical state I would have thought I had seen it all, but it was definitely one of the most spectacular stretches of track I have ever been on. Eventually the rainforest slowly transformed to bushland, and a campsite and sign marked the end of our 71km trek through the Daintree. Conscious of time, we opted to leave Roaring Meg Falls for another visit (it’s always good to have a reason to come back) and start heading to our site for the night, Archer Point Conservation Estate. But that’s a post for another time. Weeks later, on our return trip to Cairns we ended up doing the Bloomfield. And whilst it is lovely, boy were we glad we’d braved the infamous CREB instead. That all said - if it’s relatively dry, you’re in a convoy and an experienced driver it’s definitely worth a go!